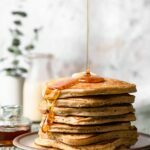 Spiced Eggnog Pancakes made with holiday eggnog, cinnamon, nutmeg and apple sauce. Fluffy Christmas Morning Pancakes recipe. Mix together all ingredients in a large bowl with a hand whisk. Pour batter onto pan using a 1/3 cup for big pancakes and 1/4 cup for small pancakes. Cook on medium heat to prevent burning. Pour batter onto skillet and let sit until bubbles start to form in the center. Use a large smooth and flat spatula to flip your pancakes. Flip and let second side cook. It should only take 1-2 minutes per side to cook. Serve pancakes warm with a slice of butter and maple syrup. Sprinkle with additional cinnamon and/or nutmeg for more spice flavor.